Manual reconstruction of Stasi documents. Source: BStU. 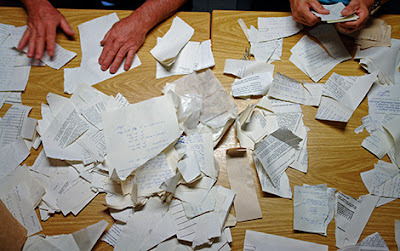 Armed with rolls of clear Scotch tape, [Solomon] Lartey and his colleagues would sift through large piles of shredded paper and put them back together, he said, “like a jigsaw puzzle.” Sometimes the papers would just be split down the middle, but other times they would be torn into pieces so small they looked like confetti. Donald Trump's habit when he is finished with documents is to tear them up and throw them in the trash or onto the floor. To prevent violations of law (if willful destruction of presidential records is not), staffers learned to collect the fragments and ferry them to the records office across the street to be reassembled by hand by Lartey (54, earning $65,969 per year) and his team. The story comes out now after a reporter approached Reginald Young Jr., 48, another senior records management analyst, to ask about his abrupt dismissal after decades in government service. The White House fired Lartey in March and Young in April, forcing them to sign pre-written resignation letters. Both have no idea why they were "stripped of their badges with no explanation and marched off of the White House grounds by Secret Service," Politico reports. Lartey corroborated Young's account of their dismissal. The White House would not comment. First to arrive in Singapore was an IL-76 transport plane carrying food and other essentials for Kim as well as his bullet-proof limousine and a portable toilet that will deny determined sewer divers insights into to the supreme leader's stools. Someone on Trump's staff will be out of a job for not thinking of that. Lartey and Young can take comfort that toilet tissue is not a presidential record. Speaking of bodily functions, Trump has an 8-inch height advantage on Kim. Maybe "the two dictators" should just find a tree and see who can pee higher up the trunk. Trump can declare himself the winner and go home without doing any more damage.